Democrats will propose bill closing background check loopholes; it will likely fail. Sens. 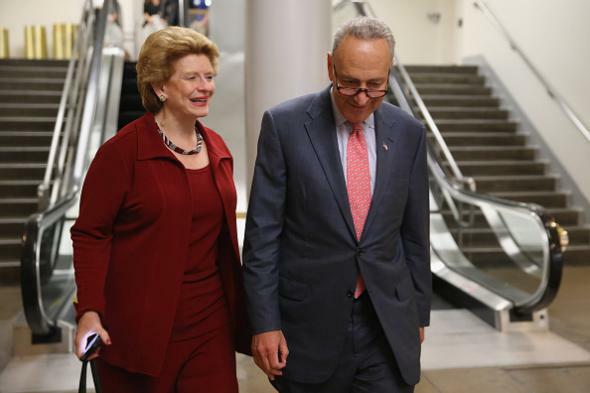 Debbie Stabenow of Michigan and Chuck Schumer of New York, shown here at the Capitol on June 1, 2015, described the plan in a letter to colleagues. Expanding the background check system to cover guns sold at gun shows and online. Adding “abusive dating partners, individuals under a court-imposed restraining order and convicted stalkers” to the list of people banned prohibited from buying firearms. Making it a crime to be a “straw purchaser” who buys a weapon for somebody else. Senate Dems apparently plan to block action on other bills until the gun control measures are brought to a vote; Republicans hold a 54-seat majority in the chamber.